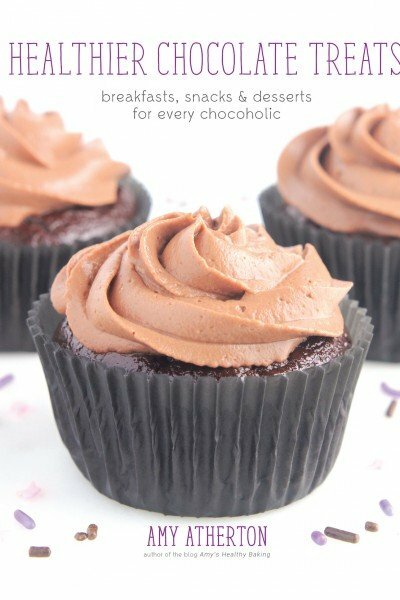 Learn how to make these rich mini chocolate cupcakes from scratch! They’re just 35 calories! 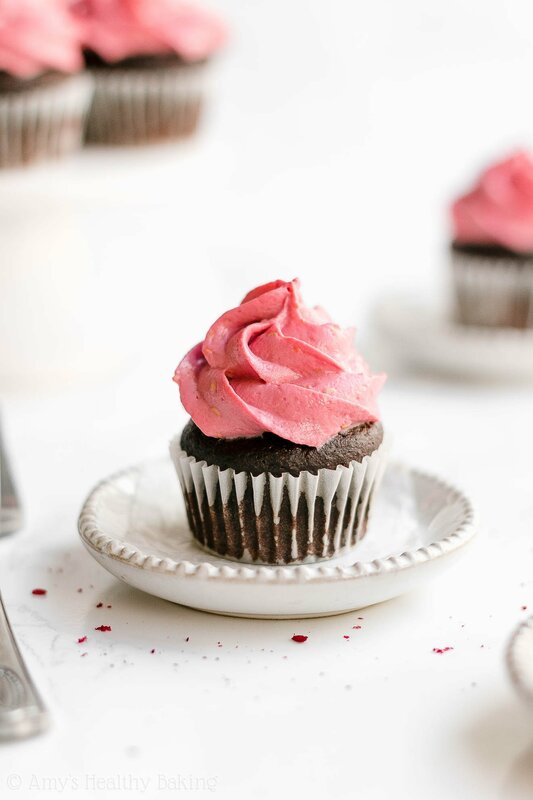 They’re incredibly moist and completely packed with decadent chocolate flavor, and the creamy swirls of raspberry frosting are the perfect topping! Partway through college, I actually began to look forward to finals week. Not because I enjoyed exams like Hermione Granger in the Harry Potter series… But because I knew I’d get a break that lasted at least a week or two (if not the entire summer!) after I turned in my last test. Watch one round of Cupcake Wars! I stumbled upon that Food Network TV series on Hulu, and since each episode contained three rounds of competition, with one of the four bakers eliminated after each round, one episode got me through at least three hours of studying. The show always had a panel of three judges critiquing the contestants’ treats: Florian Bellanger, a famous French pastry chef; Candace Nelson, the founder of Sprinkles Cupcakes; and one guest judge, related to that particular episode’s theme. Although I marveled over almost every single cupcake all of the bakers produced, especially when performing under such short time constraints, those three judges had very high standards… And I can’t imagine how nerve wracking it must have felt to stand in front of them and serve them freshly baked cupcakes! Which resulted in a big craving for cupcakes. 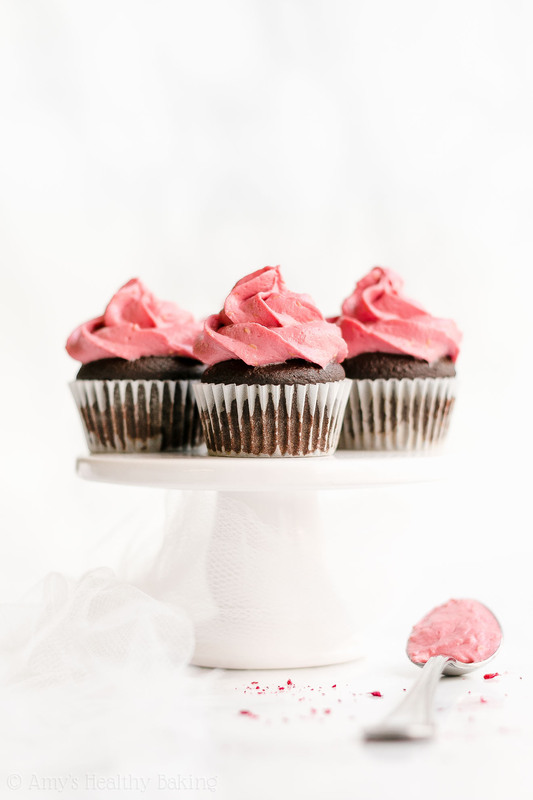 So I baked these Healthy Small Batch Mini Chocolate Cupcakes with Raspberry Frosting to satisfy my sweet tooth! Although not nearly as exotic as some of the flavors on Cupcake Wars, these sweet treats still taste incredible. 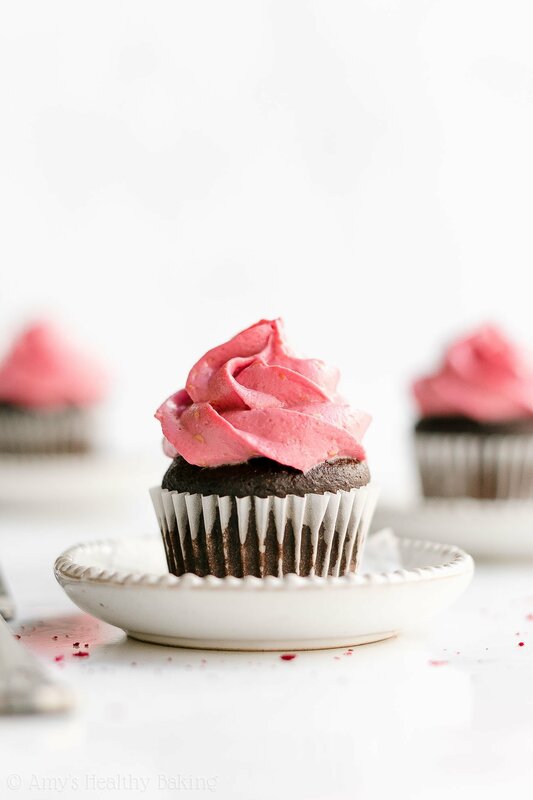 They’re supremely moist and tender with lots of rich and decadent chocolate flavor, and the gorgeous swirls of raspberry frosting add the perfect finishing touch! Also unlike those contestants’ cupcakes? 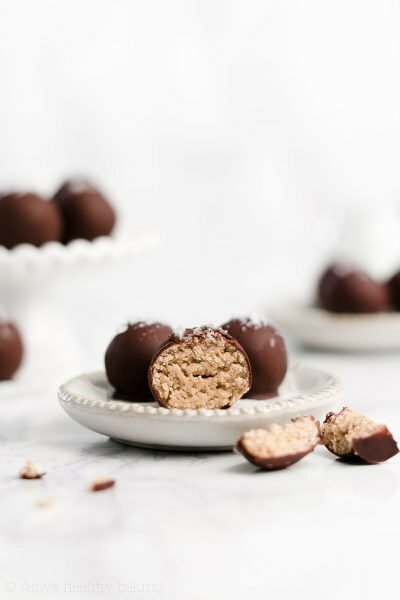 These contain no refined flour or sugar and just 35 calories! I have no idea whether Candace Nelson would approve… But I certainly hope so! 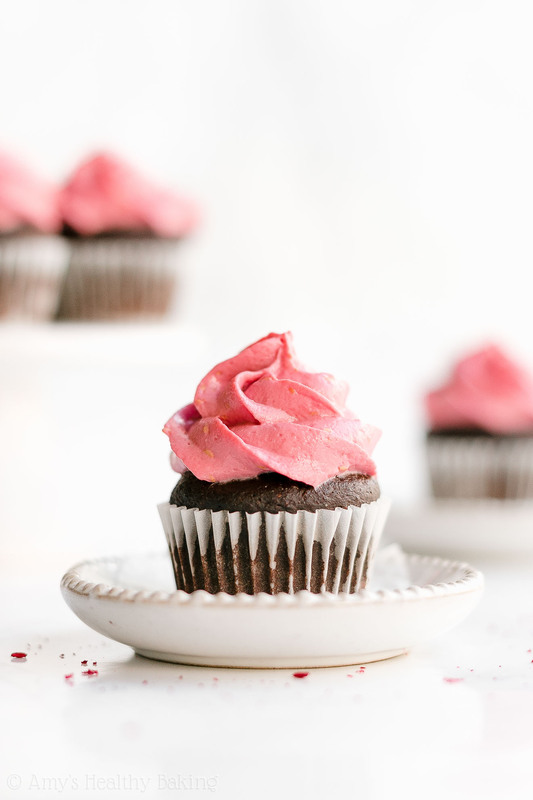 So let’s go over how to make these healthy small batch mini dark chocolate cupcakes! You’ll start with a mixture of white whole wheat flour and unsweetened cocoa powder. I actually recommend the regular kind of cocoa powder, like this, rather than Dutched or “special dark” cocoa powder. Those latter two have a much less prominent chocolate flavor in this particular recipe. Also, since you’re adding more cocoa powder than flour, your healthy small batch mini chocolate cupcakes will definitely taste exceptionally rich when using regular unsweetened cocoa powder! Hint: That’s my secret trick for making really rich and decadent cupcakes without any melted chocolate… Just lots of cocoa powder! I know that the name “white whole wheat flour” sounds a bit confusing. It’s not actually a combination of white (aka all-purpose) flour and regular whole wheat flour! Instead, it’s made by finely grinding a special type of soft white wheat (hence the name! ), whereas regular whole wheat flour comes from a heartier variety of red wheat. They have the same health benefits (like extra fiber! 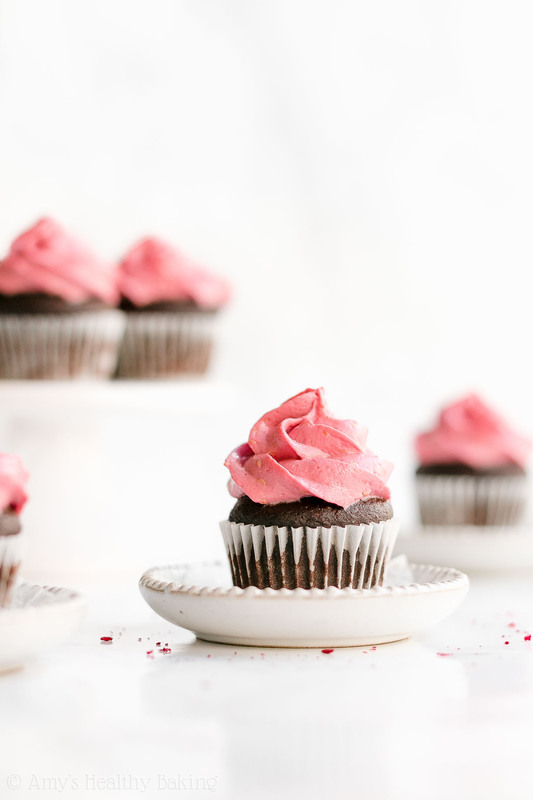 ), but white whole wheat flour has a lighter taste and texture… Which lets the moist and fluffy texture of your healthy small batch mini chocolate cupcakes truly shine! Hint: It’s like the difference between red and green grapes! Same health benefits, just a slightly different flavor. Whereas traditional cupcake recipes call for lots of butter or oil to keep them moist and tender, you just need 1 teaspoon in this recipe. Yes, that’s it! That really helps keep these healthy small batch mini chocolate cupcakes low fat and low calorie! Then the rest of their tender texture comes from one of my favorite ingredients in healthy baking… Greek yogurt! Greek yogurt adds the same moisture to your batter as extra butter or oil but for a fraction of the calories. It also gives your healthy small batch mini chocolate cupcakes a protein boost! Moist and tender… Low fat and low calorie… Lots of Greek yogurt… Does that make these breakfast food?? (I might have an even more convincing case for that later, once we get to the frosting!) ? 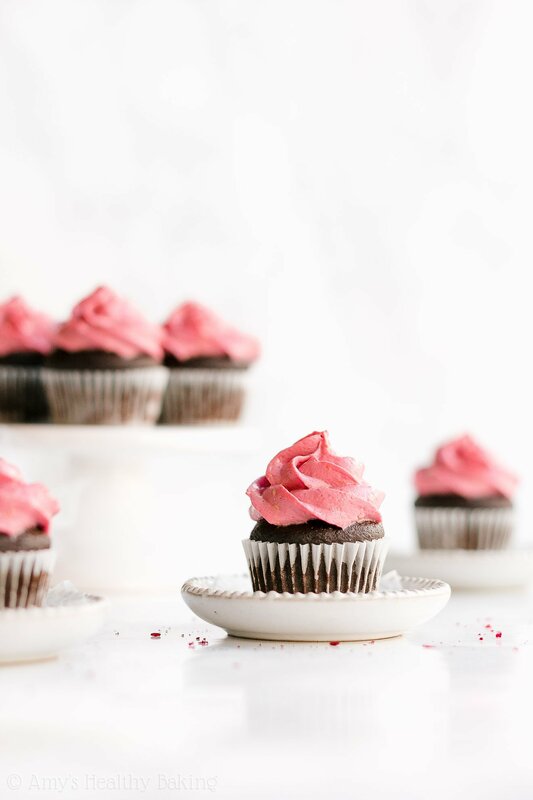 You’ll skip the refined granulated sugar and sweeten your cupcakes with another two of my favorite ingredients: liquid stevia and confectioners’ style erythritol. Yes, two. You need both sweeteners! 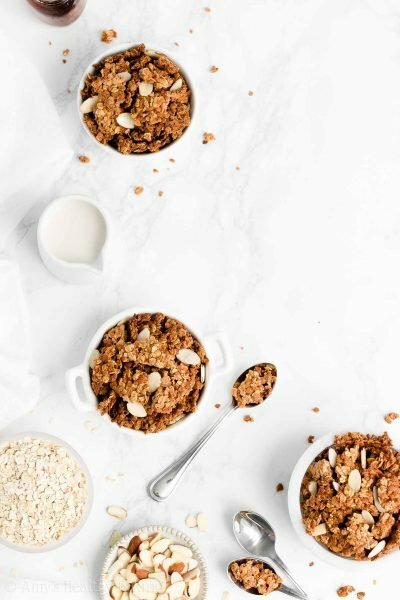 Both the liquid stevia and confectioners’ style erythritol are plant-based, no-calorie sweeteners that contain nothing refined or artificial (aka they’re clean eating friendly). The liquid stevia is very concentrated, which is why you only need a small amount, whereas the erythritol sweetens cup-for-cup like regular sugar (just without the calories!). I always try really, really hard to make recipe ingredient lists simple for you. I know it isn’t fun to track down extra ingredients, but I promise it’s easy for this recipe. I buy both of these sweeteners online! Here for the liquid stevia and here for the erythritol. When I tried making these cupcakes with just the liquid stevia, they didn’t taste sweet enough to be called a dessert. In my experience, something about cocoa powder mutes stevia’s sweetness. I’m not sure why (but as an ex-chemist, I really want to know!). Yet when I added in a small amount of the confectioners’ style erythritol, these healthy small batch mini chocolate cupcakes tasted perfect! Rich, chocolaty, and completely sweet, just like regular cupcakes! Before you add the batter to your mini muffin cups, remember to coat your cupcake liners with cooking spray. This is super important! Low fat batters, like this one, tend to stick to liners like superglue. But when you coat your liners with cooking spray first, they peel away from these healthy small batch mini chocolate cupcakes much more easily! Tip: If you forget to coat your liners, or you don’t coat them well enough, then seal your mini cupcakes inside of an airtight container for 24 hours. This helps loosen the liners a bit more! You need freeze dried raspberries! Fresh raspberries contain a lot of water, and regular dried raspberries are on the chewy side. Neither of those yields frosting quite as delicious as freeze dried! Freeze dried raspberries are on the crisp and crunchy side, so you’ll grind them into a fine powder before adding them to your frosting. A blender, a food processor, and even a coffee grinder will all work! Tip: I’ve found freeze dried raspberries at Target and Trader Joe’s! Then for the rest of the frosting ingredients, you’ll need Greek yogurt, instant pudding mix, and more liquid stevia. I know… Instant pudding mix? In frosting?? It sounds a little weird, but it’s my secret trick to pipe-able frosting! 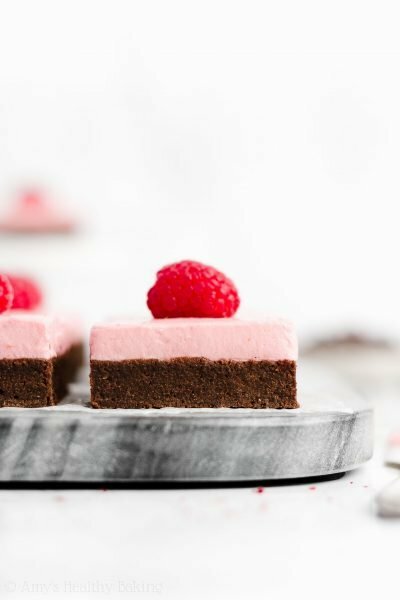 The instant pudding mix thickens the Greek yogurt while the frosting chills, which makes your healthy raspberry frosting just as thick and creamy as regular buttercream frosting. This means you can pipe those gorgeous swirls on top of your healthy small batch mini chocolate cupcakes! And since this healthy frosting is made from Greek yogurt and fruit… And the cupcakes contain even more Greek yogurt… Does that officially make them breakfast food?? 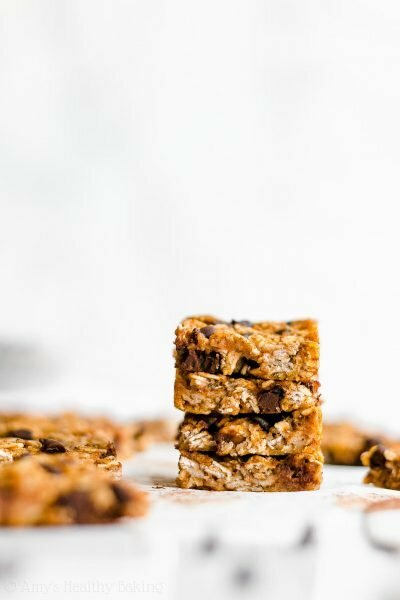 Either way… I’d definitely eat these any time of day—and I even might not want to share any! ? And when you make your own, remember to snap a picture and share it on Instagram using #amyshealthybaking and tagging @amyshealthybaking IN the photo itself! (That guarantees I’ll see your picture! ?) 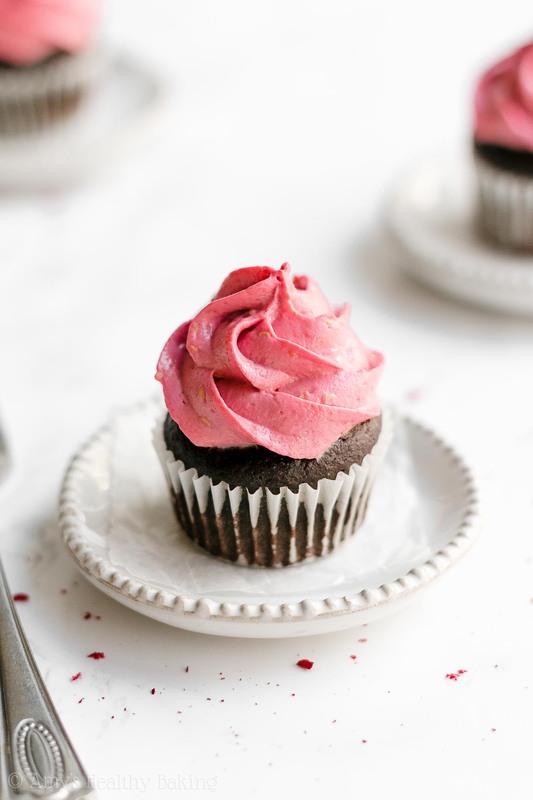 I’d love to see your healthy small batch mini chocolate cupcakes with raspberry frosting! I absolutely love these mini cupcakes! They’re supremely moist and full of rich chocolate flavor, similar to 72% dark chocolate. The creamy swirls of gorgeous raspberry frosting add the perfect finishing touch! The cupcakes are best if eaten the same day they’re frosted, but they’ll keep for at least three days (if not longer) if stored in an airtight container in the refrigerator. To prepare the cupcakes, preheat the oven to 350°F. Line 20 mini muffin cups with paper liners, and coat the liners with cooking spray. Divide the batter between the prepared paper liners. Bake at 350°F for 11-14 minutes or until the centers feel firm to the touch and a toothpick inserted into the center comes out clean. Cool in the pan for 5 minutes before transferring to a wire rack to cool completely. While the cupcakes bake, prepare the frosting. Add the freeze dried raspberries to a blender, and pulse until they’re a fine powder. Add the raspberry powder, Greek yogurt, instant pudding, and liquid stevia to a large bowl. Beat with an electric hand mixer or stand mixer for 2 minutes. Cover the top of the bowl with foil, and refrigerate for at least 2 hours. Once the cupcakes have completely cooled, pipe the frosting on top just before serving. Notes: For the gluten-free flour, use the following blend: ¼ cup (30g) millet flour, 2 tablespoons (15g) tapioca flour, 2 tablespoons (15g) brown rice flour, and ¼ teaspoon xanthan gum. Most store-bought gluten-free flour blends (like this one!) should work as well, if measured like this. Remember to measure the flour and cocoa powder using this method or a kitchen scale. (← That’s the one I own and love!) Too much of either will dry out your batter. Too much cocoa powder will also make your cupcakes taste bitter. I usually try to use just one sweetener to make life easier for you! However, I found that the cocoa powder muted the liquid stevia’s sweetness. 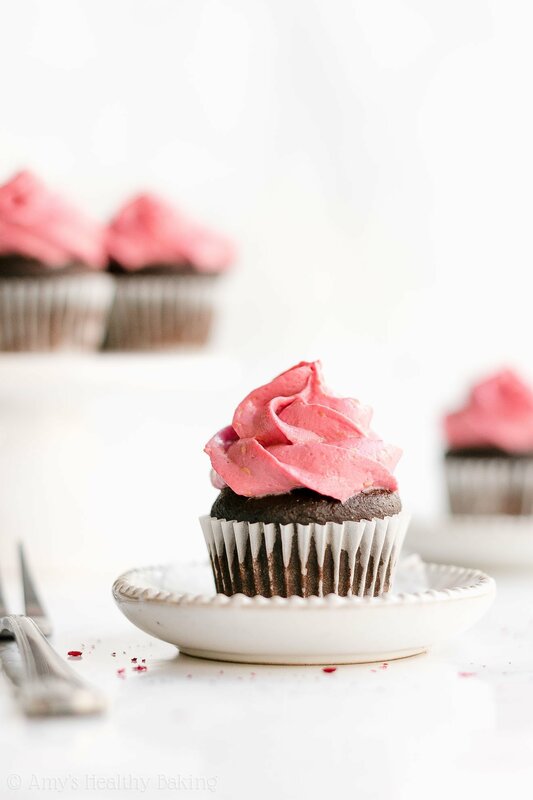 Once I added those 2 tablespoons of confectioners’ erythritol, the cupcakes tasted SO much sweeter, like true store-bought cupcakes—so I promise it’s worth using both! I highly recommend using the liquid stevia! It’s one of my favorite ingredients (you’ll use it in all of these recipes of mine! ), and I buy it online here because that’s the cheapest price I’ve found. If you prefer not to use stevia in the cupcakes, substitute 6 tablespoons (90mL) of agave, honey, or pure maple syrup for the liquid stevia. Reduce the milk to 3 tablespoons (45mL) if using any of these options. (The batter should be fairly thick, similar to muffin batter.) If you prefer not to use the liquid stevia in the frosting, then substitute ¼ cup of powdered or granulated sugar. I buy my confectioners’ style erythritol online here. If you prefer not to use erythritol, then substitute 2 tablespoons (24g) of coconut sugar, brown sugar, or granulated sugar. Granulated sucralose will also work in place of the confectioners’ style erythritol, if you prefer a different no-calorie granulated sweetener. This is the instant pudding mix that I use. You just need the dry instant pudding mix—don’t prepare it according to the package directions! 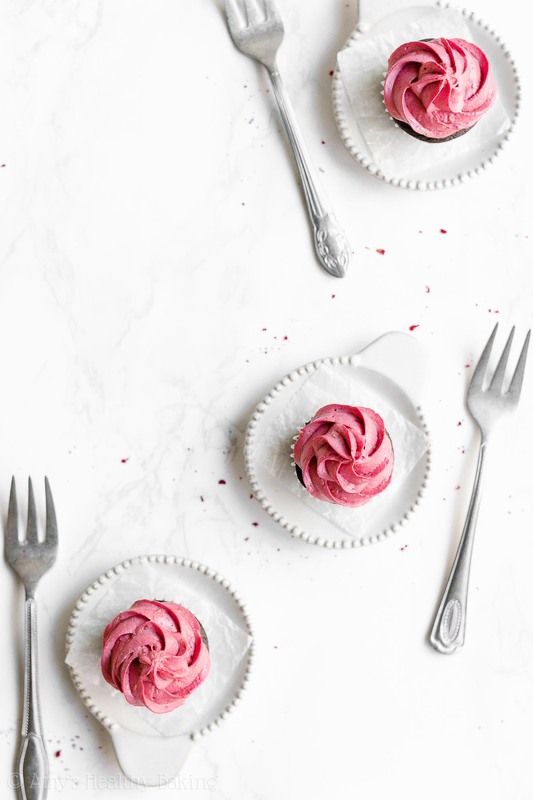 You can omit it (for a clean eating option), but the frosting won’t be as thick, and you’ll probably need to spread it on the cupcakes instead of piping it. I’ve found freeze dried raspberries at Target and Trader Joe’s! 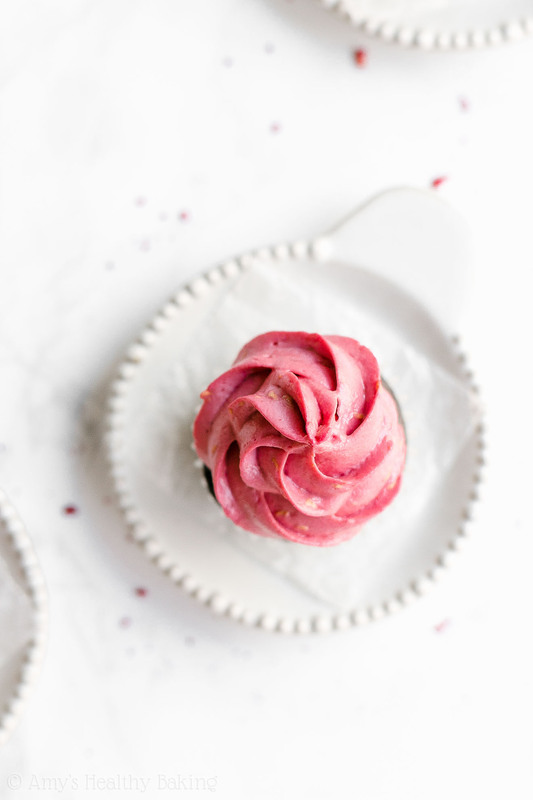 If you can’t find freeze dried raspberries, use this raspberry frosting recipe of mine instead. This cupcake recipe is easily doubled to yield 12 standard size cupcakes! (You shouldn’t need to double the frosting. This frosting recipe makes a lot!) Remember to coat the cupcake liners with nonstick cooking spray first. Bake the standard size cupcakes at 350°F for 19-21 minutes or until the centers feel firm to the touch and a toothpick inserted into the center comes out clean. 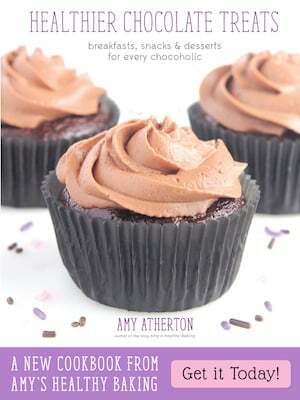 ♡ …and the rest of Amy’s healthy cupcake recipes! HI: these look great. Your recipe is my basic microwave cake recipe for 4. Nothing healthy about stevia or erytrytol except that they don’t have as many calories as cane sugar. Cane sugar is at least as healthy, and takes a lot fewer chemicals to extract the sweetness from the cane than does extracting the sweetness from stevia. But anyway. In my recipe I use 2 tablespoons of sugar, which is the equivalent of 96 total calories for the whole cake part of the recipe. Honey has 21 calories per tsp and I would use about 1 1/2 tbsp if using honey. Either way, the issue is not that cane sugar is bad for you, the issue is portion size. Sugar-free instant pudding is full of terrible chemicals that I would never eat. Mash up some berries, whip up some cream or coconut cream and add another spoonful of sugar and the mashed berries to the cream, for a great frosting without all the crap in the sugar-free instant pudding. We need to stop giving cane sugar a bad rap. The problem is portion control, not the ingredient itself. All those substitutes are very expensive as well. By the way. I bake my cake in the microwave on high for about 2 1/2 minutes–micros vary of course. Let cool in baking dish for about 2 minutes and turn out. It is amazingly light with a great crumb and texture. I have a number of variations oaths recipe, for vanilla, and spice and fruit and key lime and on and on. I find that a 1/4 tsp of apple cider vinegar works wonders for the texture as well. My favorite version: add in chopped dried cherries and coconut to the chocolate cake. Amazing…. I agree with the comment above. Sugar free instant pudding mix has no place in a “healthy” recipe. Neither does stevia in my opinion, but the pudding mix is the deal breaker. I really appreciate your interest in my recipe Gloria! I’ve actually already included an alternative that doesn’t use instant pudding mix in the Notes section (located directly underneath the Instructions), as well as alternatives for the stevia. I know not everyone is a fan of instant pudding mix or stevia, and I want to make sure my recipes are as appealing to those people as possible! 🙂 I’d love to hear what you think if you decide to try these cupcakes!